Most Hollywood fictions have a set of guidelines for colors, humor, locations, etc., that help to make a classic yet an engaging movie. Why don’t you use the same criteria for explainer videos? Rather than deciding everything on the spot and creating a mess, try to follow a basic pattern regarding video making while getting it to your audience in the best way. Following a basic pattern will make your explainer video script engaging just like a Hollywood flick and drive more conversions. At Webdew we follow a three-step process prior to beginning with any video because it helps us to make videos completely aligned with our clients’ requirements and goals. Start with a brief discussion on problems of your target audience that your product will solve. If your audience would be able to relate itself to your video, it is most likely to watch till the end. Viewers often look for the what factor in videos and when they get the answer to it, the chances are high for a purchase. Once you target the problems of your audience well, it’s time to describe how your services or products troubleshoot its issues in an exceptional way. Don’t make it promotional as it would describe your desire for achieving more sales. Keep your approach explanatory by describing your concern as this would generate an interest in your services. The solution has to be comprehensible and straightforward, leaving no chance of error. Problems and solutions are what drives the above two sections. What if your competitors also follow the same approach to offer similar products and services? How would you ensure that your audience does not buzz off to another service provider? Here you need to put the best foot forward with a killer marketing strategy. You have to tackle the why factor here. Give your audience solid examples to explain why they should choose you above the others. This is the most critical part of any video as your audience will compare you with your competitors. The crux of this section is generating familiarity of the audience with one’s brand so that they develop a sense of trust in your brand. Making an explainer video becomes easy and interesting when you have the right strategy in place. Writing a script is not for everyone as it needs creativity and logical thinking. A writer needs to keep up actual essence of the brand in a script to deliver the desired message. I hope you know that the length of a video is inversely proportional to the average watch rate. Therefore, the higher the length of a video is, the lesser will be the viewership number. The longer a video is, the less likely people will be to watch it all the way through. This is a fact: about 85% of people watch a 30-second video to the end, and only 50% of them watch a video completely up to 2 minutes. This is a decent difference, but it does make a difference. So what do I want to convey here? It’s simple- go for brief! The script decides the length of your marketing video. The question is how do you decide the length of your script for a video? Easy-peasy: A one minute video equals 160 scripted words in English. At Webdew, we prefer 240 words that are 90 video seconds to explain the story of your interest. I hope you have got my point of “short better” to deliver any idea quickly and directly so that your audience enjoy something fresh and unique and steers evident boredom. So you have a short video at your disposal, but what content you would integrate to cover all essential points. This is the creativity of a scriptwriter who must craft a brief script while describing the core of your business. Only hit the major points and give your audience only required information. This should be the protocol only in the beginning of marketing; once your viewers turn into visitors, you can highlight your services to turn them into buyers. A critical point to remember during the making of an animated marketing video is your audience and how you can solve their problems. Show your helping attitude toward your audience rather than selling your services if you really want to develop a bond of trust and loyalty. Caution: If you only talk about your brand's features, the audience might bounce away, and you miss out on potential opportunities you might have won by portraying your brand in a user -friendly way. Try to build a close liaison between your brand and viewers to harness the power of digital marketing. Finally, it’s your turn to appeal for a subscription. Explain viewers clearly explain what you want from viewers after watching your video. From downloading an eBook to a free demo to sharing on social media, ask your viewers for call-to-action. Trying for multiple calls to actions in one video might sound pushy to your target audience, or it will bring confusion that might not pay you off with subscriptions. Keep it to one- straightforward and clear. Though there are some conditions when your marketing strategy requires different calls-to-action, then try to craft different versions of the same marketing video with a different call-to-action in each; then, conduct A/B testing to check which drives the traffic. I hope the ideas mentioned make you a pro in script writing. A good script is a gateway to higher conversions and brand presence. 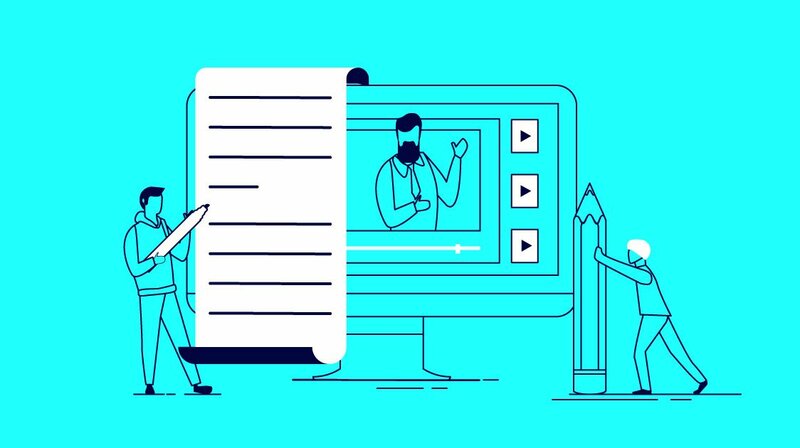 Explainer videos are the lynchpin for digital marketing, though many businesses are not aware of it. Explainer videos have great potential for attracting more prospects and converting them into leads, if made properly. If you have any other queries, you can comment below, and our experts will get in touch with you shortly.